Set around 12 German-speaking people and the worlds they live in, WELTEN focuses on the development of communicative competence and literacy through texts in various modalities. WELTEN helps students to acquire and practice functional language abilities while at the same time developing interpretive and analytical competencies and an appreciation of the aesthetic qualities of language. Through current, relevant, and meaningful materials, students learn to use language while seeing the world through the eyes of others, ultimately learning about themselves and the world they live in. 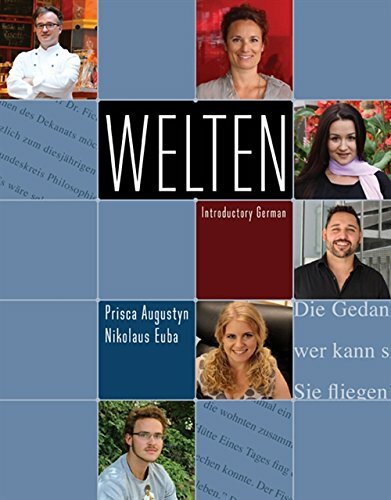 With its innovative and integral video program, its contextualized and learner-centered presentation of grammar, and its unique selection of engaging texts from a broad range of genres, WELTEN brings a new approach to introductory German. Prisca Augustyn is an Associate Professor of German and Linguistics at Florida Atlantic University, where she has been in charge of German since 2002. Prisca teaches courses in German, linguistics, and semiotics. Her interest in how we form subjective models of the world through language informs not only her research in linguistics/semiotics, but finds expression in the development of teaching materials and methods for the classroom. She and her co-author Nikolaus Euba (University of California, Berkeley) recently finished the third edition of Stationen, a textbook for intermediate German.